In the context of its international development, ARAMINE IS NOW HIRING . 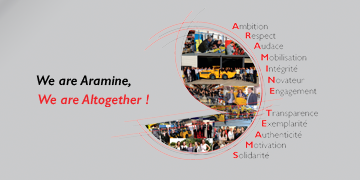 Aramine, the adventure of a family company with an international dimension, has become a leader in the field of equipment for mines and underground works. With a current presence on five continents, in over 88 countries, our success is built on strong, lasting values, which we have kept since the early days of the company : respect for human values, team spirit, customer service, ethics, reactivity, efficiency.